Ada pertanyaan untuk Jolly Suites & Spa Hotel? 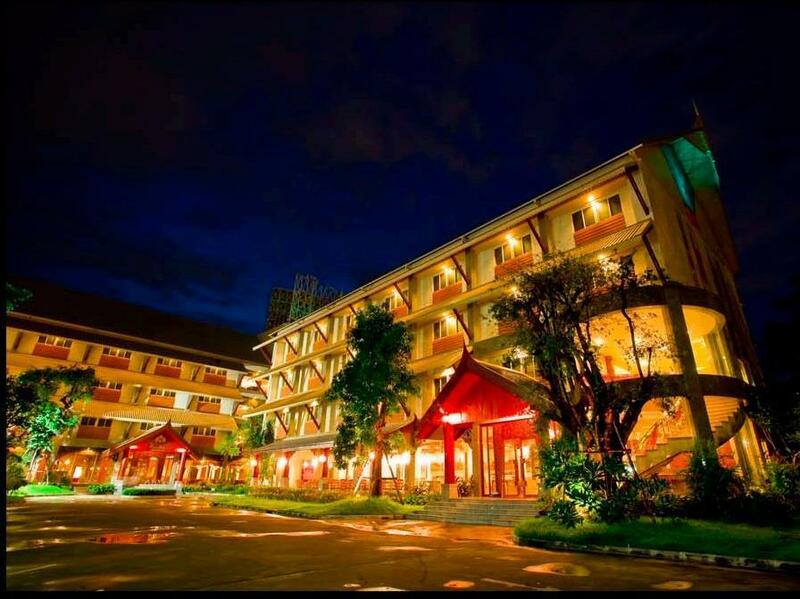 Terletak di Thonburi, Jolly Suites & Spa Hotel merupakan tempat yang sempurna untuk menikmati Bangkok dan sekitarnya. Dari sini, para tamu dapat menikmati akses mudah ke semua hal yang dapat ditemukan di sebuah kota yang aktif ini. Dengan adanya obyek wisata utama kota ini seperti Talad Plu Market, Admire Tailors, Wat Intharam Worawiharn yang sangat dekat, pengunjung akan sangat menyukai lokasi hotel ini. Jolly Suites & Spa Hotel juga menawarkan berbagai fasilitas untuk memaksimalkan pengalaman menginap Anda di Bangkok. 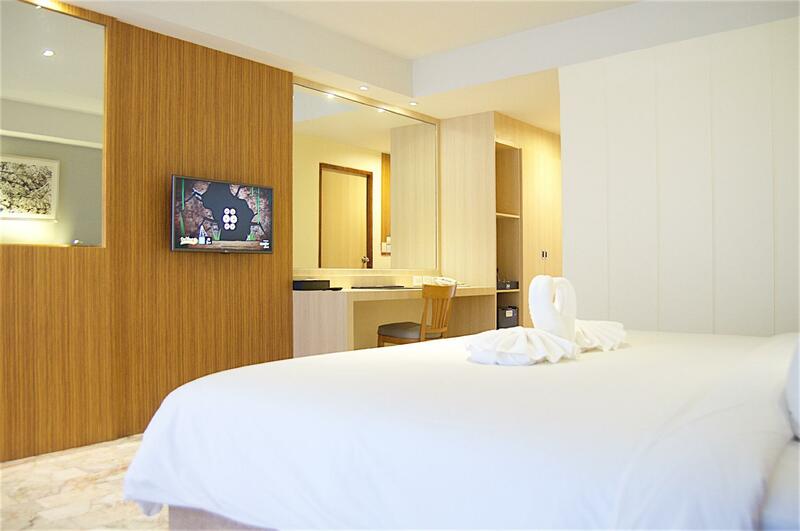 WiFi gratis di semua kamar, satpam 24 jam, layanan kebersihan harian, resepsionis 24 jam, Wi-fi di tempat umum hanyalah beberapa dari fasilitas yang membedakan Jolly Suites & Spa Hotel dengan hotel-hotel lain di kota ini. Suasana Jolly Suites & Spa Hotel tercermin di setiap kamarnya. televisi layar datar, kopi instan gratis, linen, cermin, sofa hanyalah beberapa dari fasilitas yang dapat Anda nikmati. Daftar lengkap fasilitas rekreasi tersedia di hotel termasuk pusat kebugaran, kolam renang luar ruangan, spa, pijat, taman. Fasilitas super dan lokasi yang istimewa menjadikan Jolly Suites & Spa Hotel tempat yang sempurna untuk menikmati penginapan Anda selama di Bangkok. Properti mewajibkan uang jaminan sebesar THB 1,000 pada saat check-in. pros -A.C. in the room. -near MBT station. -parking place for your car. cons - breakfast not included. - thers no water regulation or hot or cold. - staff doesn't speak english (but was very kind to us). there is also swimming pool, but we haven't seen it. I asked at the counter whether there is massage service and the staff just informed me that they only have two massaguer. Need booking advanced. After asking around the hotel surroundings there don't have any proper massage shop. This is a large hotel, very clean, comfortable, huge swimming pool and fitness area. It was a perfect hotel to recover in after surgery at a near by hospital. There are many shopping malls and food markets everywhere within walking distance. Definitely worth the price you pay. Its also very quiet at the end of a lane. Extremely comfy beds and super clean!!!!! Thank you Eliza for your great review. We hope to see you again soon when you visit Bangkok next time. The facilities and cleanlyness of the rooms were amazing. I needed a nice clean spacious room to recover in after surgery. My husband said it had the best pool area to exercise, close to all night markets and malls. Its quiet and hidden off the main road. A very pleasent stay. Horrible expérience. Except : The room is good and clean. And the swimming pool too. But there is no customer service at all, they don’t care about their clients. If you want something... do it by yourself... the price of the things depends on the person (the gym, ...) The manager doesn’t care about you. The staff does not speak English. We ask to charge your phone in the common areas, no they don’t want. Very badly located if you want to go downtown. Ghost hotel, no customers ... even though it’s a big building (no body at the restaurant too) Run away ! Thank you for your review that our room is good and clean and good swimming pool. We are sorry for your inconveniences. However you have lost our room keycard, there is a fine for lost key card but you refused to pay, and in the end we did not charge you for the card. You also wanted to use the swimming pool after checkout and taken our hotel's towels with you. As we could not provide you with your request, you have caused a scene in the reception area disturbing other customers. Thus you have bad impression on our hotel. We apologize for your inconveniences. Three days to start and one night at the end of a three week multi stop tour of this country. This hotel is located down a little back street, which makes finding it difficult, but once found it is very good and very near to the sky train. The language barrier was a bit of a problem but with goggle translate we managed. Staff where helpful. One issue is, if you have an early check out the lifts do not go to the ground floor , and you have to carry suitcases down a lot of steps which is difficult. 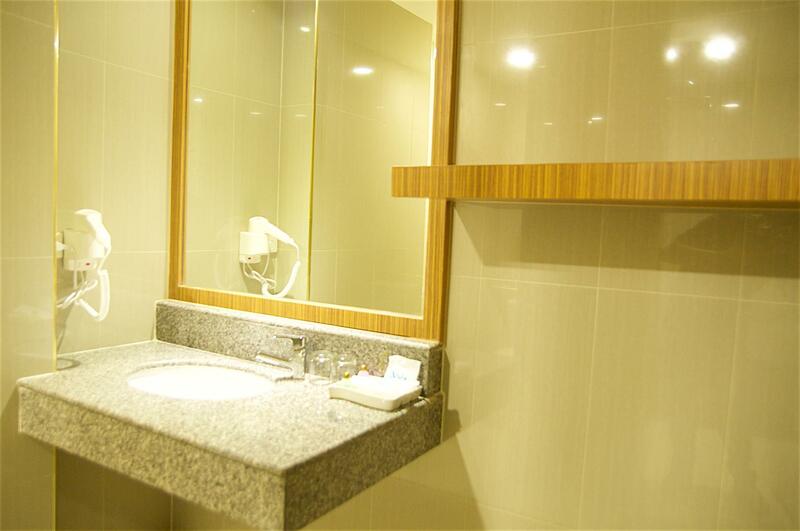 Facilities where excellent, however don't expect very hot water for shaving or showering but that is all over Thailand. we would defiantly stay at this hotel again. Oh and the last thing to mention is that the beds are the best in Thailand so soft and clean. This has been my fifth or sixth stay here, and I like it. Quiet, convenient and accessible to so much local flavor. The Chinese restaurant on premises, is a bit pricey, and the quality of food is not a s good, but then again, unless it is raining heavily or you are too tired to make the walk down the street, it can serve as an option. They do not add the charge to the room, so keep cash handy when ordering room service. This is my third visit and each visit was extended with no issues. The restaurant (Chinese) has average standard food, the pool and gym are excellent, and walking to the mall is convenient for a variety of personal needs including a food court with various food choices. A nice quiet place to relax and unwind. 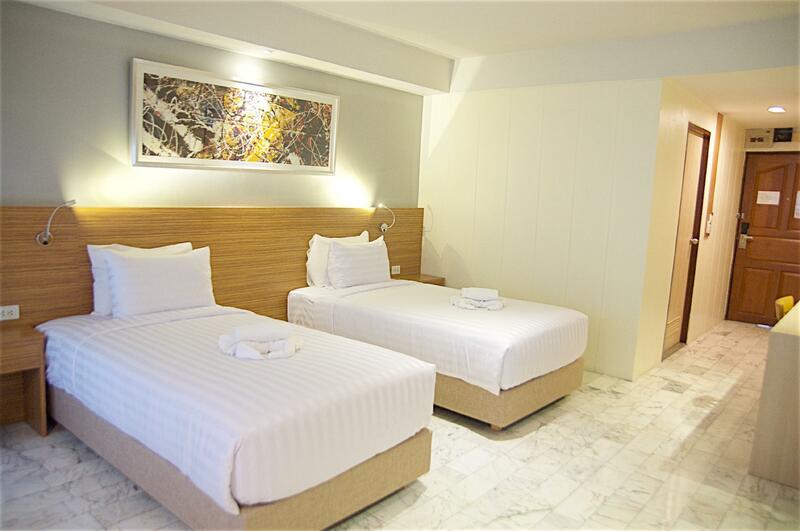 Rooms are spacious, bed is large and comfortable. good value for money. The check-in was a bad start already: 1000 THB deposit for the key card! It seems they made some bad experiences with their favorite clients... This info should be given in advance, I never experienced that in my 40 years with Thailand. This hotel surely had seen better times, few staff, little English. But the rooms are ok and clean, the swiimming pool is huge and refreshing. No real infos, eg. about breakfast or checkout times, but a list of prices for stolen goods and for fines of every kind... of course everything in Thai only. The breakfast was a bad surprise, no eggs or bacon, no real juice, no butter, artifical jam... only rice soup with chicken or pork. Not to speak about the coffee.... The area there is good if you want to travel into the city by BTS train. My wife and I stay here every time we visit Bangkok. As it’s very convenient to many places. 3 minutes walk from Taladphlue BTS . Walking 7 minutes to The Mall. It is the big shopping mall with supermarket and foodcourt. I recommend all travelers to stay here. Don’t forget to book the spa here so that you can enjoy and relax during afternoon after checkout and do spa and massage before lunch. Their Buffet Dimsum “All you can eat” is really superb and worthy. It’s only 495฿ net/person. It’s taste like hong kong style. All staffs here are very helpful and friendly. We will come back again as usual. Thank you for your frequent visits. newly renovated room super clean. Everything is really good. I love the bedding quality. It is so soft and clean very comfortable. The restaurant is also very good we had dim sum there. Peking Duck very delicious too. I booked a spa package for my wife on the nextday before we chk-out. She really enjoy relaxing with politeness peace and calm environment with no comments, everything is perfect especially the aroma spa course is very nice. We will come back again for sure. Easy walk to BTS sky train no need to connect to different BTS line for going to city center such as Siam and Silom. near by 7-eleven and shopping mall. Room is just renovated clean and comfortable bed. Big pool and spa is a plus. very good price. the room is just renovated. clean and free wifi. near sky train conveniently to get to the city. nearby convenient store, food and shopping mall. also great spa and pool. great value for the price. will stay again. Staff not interested from check in until check out. Whole experience stay at Jolly Suites & Spa was a disaster from the start till the end. Staff doesn't bother when making a new booking for an extra room and continue with his sleep as if customer disturbing him from his sleep at the counter. During check out was tokd to pay 200B for a face towel that has rusty stains on it even when we checked in. This is totally absurb and unacceptable giving the fact that the dirty face towel provided during cgeck in. This place is basically a 'Black Shop' waiting to prowl on it's victims. Didn't want to waste further time in arguing just paid and took the dirty face towel worrying that they will use the same face towel for the same trick again. Didn't see any other guests staying there except a male guest throughout our 1 night stay there fortunately. jolly is near the skytrain so very easy go in town. 5 min. walk from hotel i will say you have to like thaifood only thai shop for eat there but is nice we go because near skytrain and close to my fam. the swimmingpool is nice but staff dont understand english very well that is the minus i will say everthing else is good there.. Always a nice stay here. Large condo style rooms with dining table and chairs. Small balcony. Big pool. Nice fitness center.with a beautiful spa. Secure parking. Easy access to public transportation. Hard beds though. For the money spent, this place exceeded my expectations. The 2 bedroom suite was very spacious. Old, but spacious! The pool was big, with a "kiddie area". A BTS station is really close to the hotel, but the hotel was hard to find driving to it! The one onsite restaurant had a limited selection and there are only local Thai "restaurants" near by. We stayed here because of the price/room size and I would stay here again under the same conditions. We have stayed here many times in the past 4 years. There is a nice big pool, a nice fitness center and a beautiful spa. Only one downside, the beds are a little hard, as are so many in Thailand hotels. Close to BTS station. Close to "The Mall" for some western food restaurants. We stayed at the Jolly many times in the past 3 years. It is a little bit from the tourist attractions but now has a BTS station very close. They have a large outdoor pool, a good fitness center and a first class spa. The rooms are large, more like an efficiency apartment, with dining table and chairs.